When choosing exterior paint, there is more to consider than whether the color looks nice. Exterior paint color performance is improved with new paint formulas but that doesn’t mean that they are immune to the effects of Mother Nature. Proper preparation will help you get the most bang for your paint buck, but for the best results, it’s also important to choose colors that will resist fading and oxidation. Generally, the colors that do best, outlast others, are the tones and hues represented in nature. Fortunately nature offers a wide variety of colors and hues to meet any need or desire. The browns and reds of rock or the greens of trees are some of the most stable colors to use. These also have better coverage over dissimilar colors. Light colors reflect light, rather than absorbing it. This makes them a good choice for hot climates. They are very resistant to fading, but may show dirt, mildew, and other discoloration, and have to be washed fairly frequently to look good. Darker colors hide more, but they also need to be repainted more often to retain their original look. Because deep shades absorb UV light, they are susceptible to fading. Areas exposed to a lot of sun will be substantially lighter than shaded areas on the same house, within just a few years. Efflorescence and chalking caused by moisture problems are more visible on dark exteriors. Going too dark can also make your home look drab and dreary, rather than inviting. Red pigments are notoriously unstable and tend to fade and discolor more rapidly than any other hue. Blues and greens also break down and oxidize more quickly than earthy tones do. Best to use these colors for accents and not large areas. Bright pastel Yellow and Gold are some of the worst colors for coverage. These can take 4 or more coats and seem to not cover themselves. It is best to avoid these if possible, although yellow is a popular color for “country” or cottage color schemes. If you have to use a yellow try to use one with a little brown or gold in it for better performance. The longest-lasting shades are also the least likely to offend neighbors and the HOA. Medium beige, gray, browns, and terra cotta all age slowly and gracefully. Of course, if you don’t mind frequent repainting, feel free to choose any shade you like. 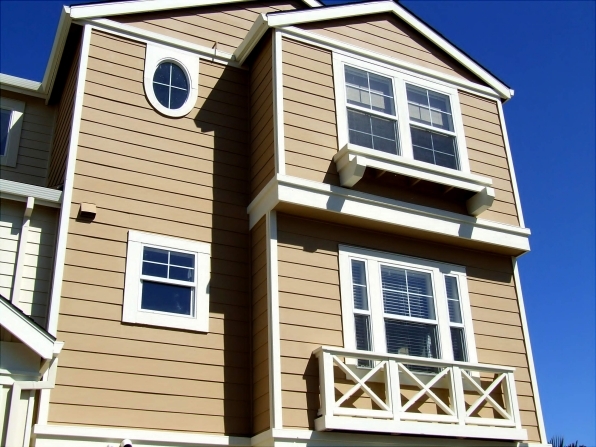 For the best exterior paint color performance choose earthy neutrals. These are some examples of “safe” paint color combinations for exterior use from Sherwin Williams.